A little bit Chelsey, a whole lot of sweet! 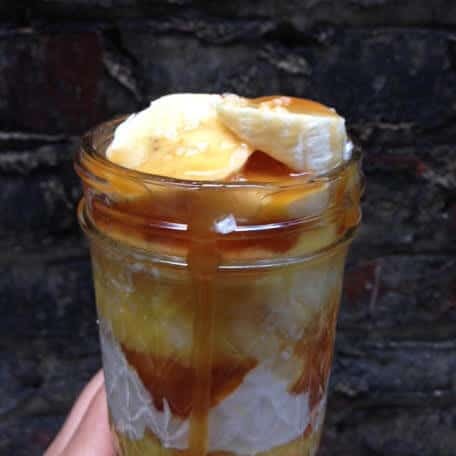 Banana pudding is such a perfect summer dessert. It doesn’t require any time in oven, it takes minimal prep time, and it isn’t too heavy! Especially this version. I lighted it up by swapping out the heavy cream for lite Cool Whip, and mixed the almond milk with the pudding. I also increased the ratio of bananas to pudding and wafers. These little changes make a big difference, and leave you feeling great! Combine the chilled almond milk with the pudding, and whisk until fully combined. Let the pudding chill in the fridge for 30 minutes. While the pudding chills, prepare the salted caramel sauce. Pour the sugar into a large, heavy-bottomed pot, and whisk until completely melted. The sugar will clump in the beginning, but don’t worry…it will melt completely with time. Allow the sugar to cook until it turns a beautiful amber color, and has a nutty aroma. I don’t have a candy thermometer, so I go completely by visual cues. At this point, remove the mixture from the heat. Whisk in the butter, then the cream. The mixture will bubble up, so be careful during this stage (I burned my finger!). The last step is to stir in the salt. Let the caramel cool to room temperature.You can store leftover caramel in a mason jar (I had about 3/4 cup left over). It will last in your fridge for about two weeks. Wow, it looks and sounds amazing! Oh my word! 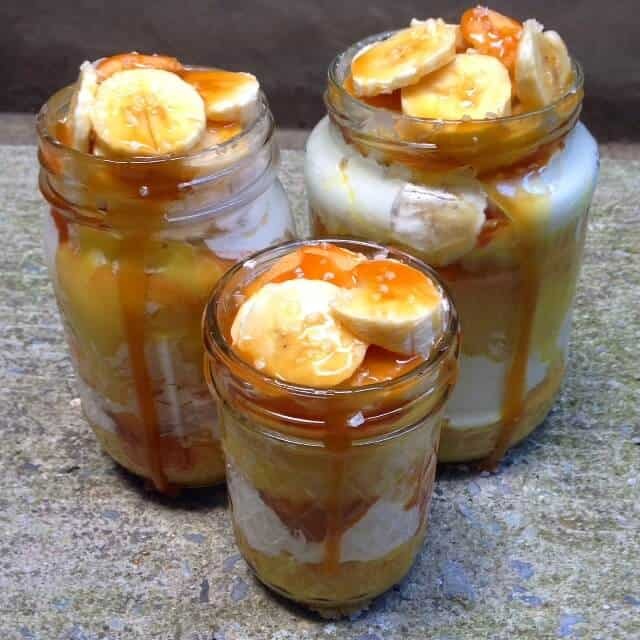 I am dangerously in love with anything banana, caramel, pudding and skinny…..I need these in my life right now!!!!! hahahahhahah 😀 It’s nice being able to eat a good serving of this and feeling good! This background is a photo of my favorite sprinkle blend from the amazing Neon Yolk Shop! Head over to her Etsy store to get your hands on some of her amazing sprinkle blends.